Something about bridges and sunsets – the contrast of human effort and natural beauty! The Mackinac Bridge connects the upper and lower peninsulas of Michigan across the Mackinac Straits that join two great lakes (Huron and Michigan). The Mackinac Bridge is over 8Km long with the longest span of over 1Km. 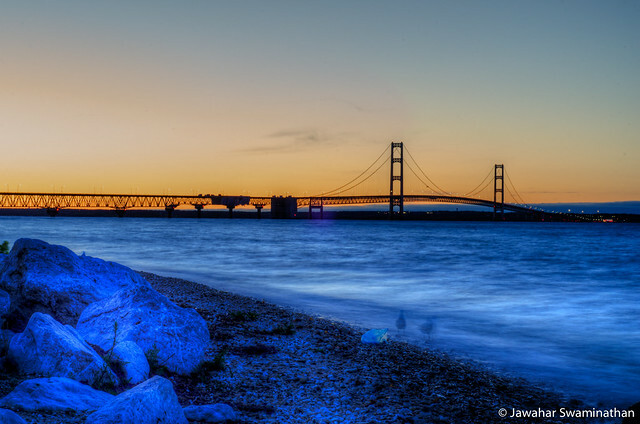 The following photograph is as a result of a long exposure at sunset from a place on Mackinaw City. Sunset over Mackinac Bridge. MI. Please click on the photo for other viewing options on Flickr!